Ozone is Earth's natural sunscreen, shielding life from excessive amounts of ultraviolet radiation. 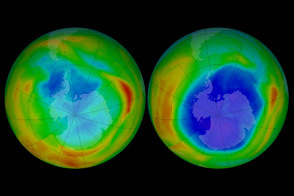 But Earth's ozone layer has been damaged by well-intentioned chemicals—chlorofluorocarbons, used for refrigerants and aerosol spray-cans—that have the unintended consequence of destroying ozone molecules. This series of images above shows the Antarctic ozone hole on the day of its maximum depletion in four different years; that is, the days with the thinnest ozone layer as measured in Dobson Units (DU). The measurements were made by NASA’s Total Ozone Mapping Spectrometer (TOMS) instruments from 1979â€“2003 and by the Royal Netherlands Meteorological Institute (KNMI) Ozone Monitoring Instrument (OMI) from 2004â€“present. 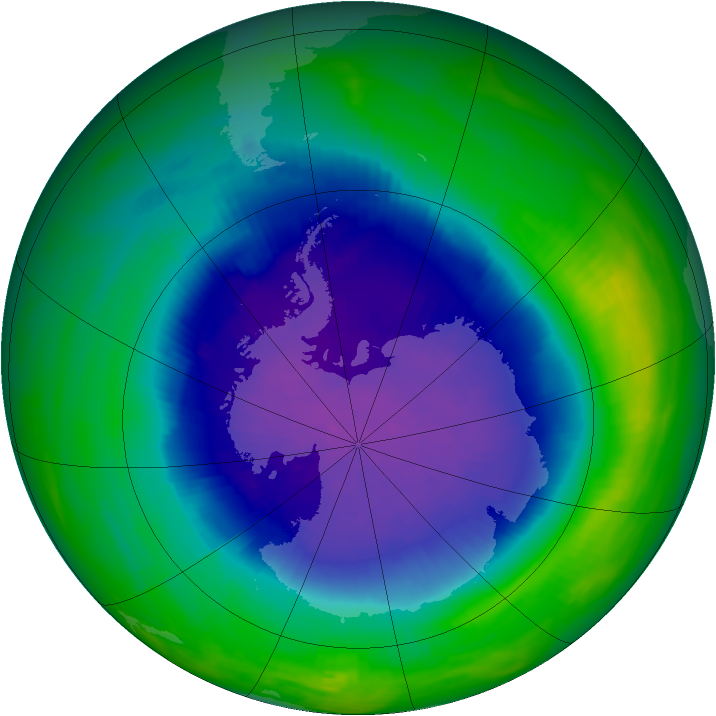 Purple and dark blue areas are part of the ozone hole. On September 17, 1979 (top left), the first year in which ozone was measured by satellite, the ozone level was at 194 Dobson Units. On October 7, 1989 (top right), the year that the Montreal Protocol went into force, ozone dropped to 108 DU. On October 9, 2006 (bottom left), ozone measured 82 DU. By October 1, 2010, the value was back up to 118 DU. The lowest value (deepest hole) ever recorded was 73 Dobson Units on September 30, 1994, while the broadest hole occurred on September 29, 2000, when the ozone-depleted area stretched 29.9 million square kilometers. 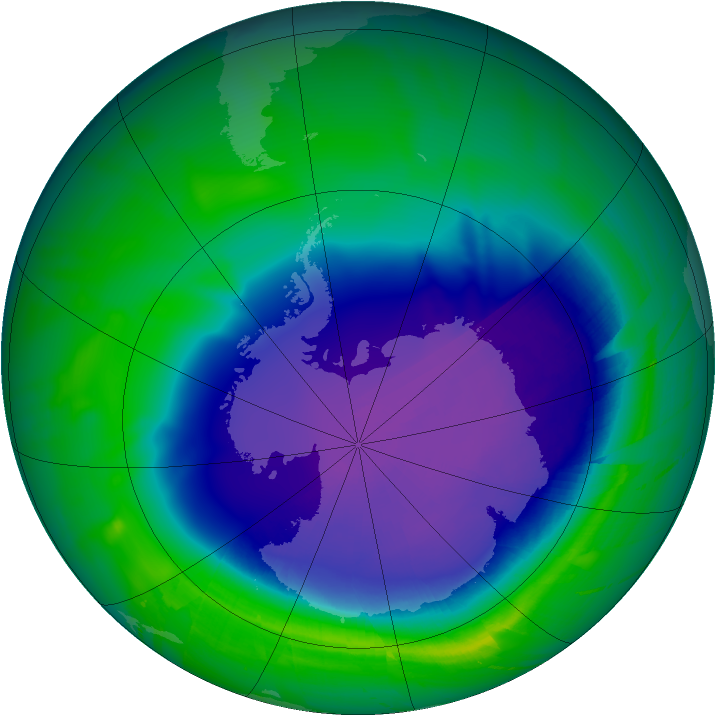 The record for mean size of the ozone hole—the greatest extent over a one-month window—was September 7 to October 13, 2006, when the hole reached 26.2 million square kilometers. 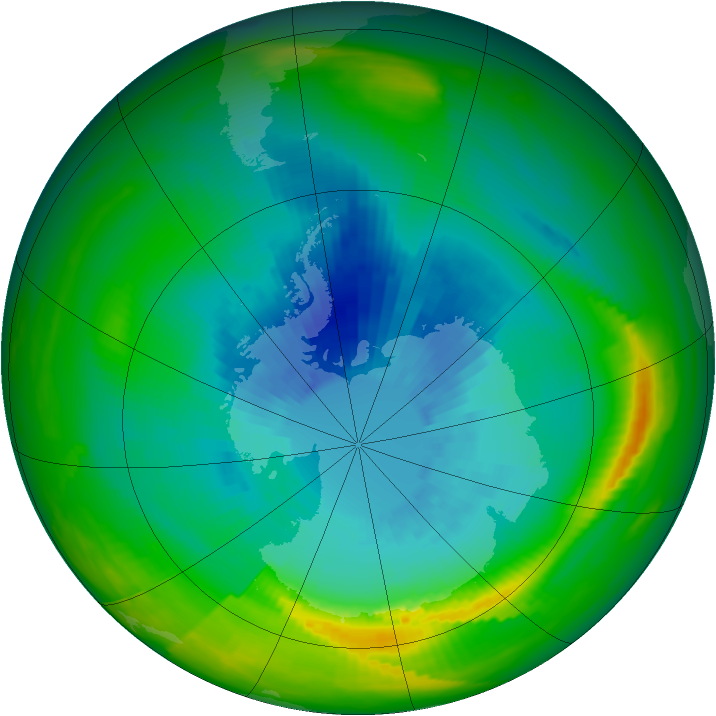 The mean ozone hole in 2010 was 22.2 million square kilometers.  Global ozone and ozone in the Arctic and Antarctic is no longer decreasing, but is not yet increasing.  The ozone layer outside the Polar Regions is projected to recover to its pre-1980 levels some time before the middle of this century. 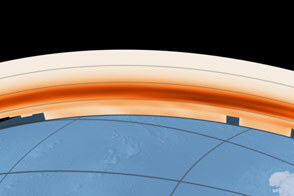 The recovery might be accelerated by greenhouse gas-induced cooling of the upper stratosphere. 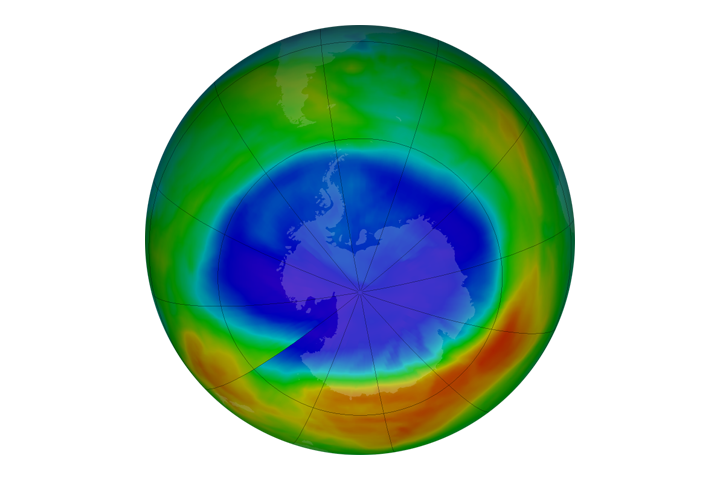  The ozone hole over the Antarctic is expected to recover much later.  The impact of the Antarctic ozone hole on surface climate is becoming evident in surface temperature and wind patterns.  At mid-latitudes, surface ultraviolet radiation has been about constant over the last decade. NASA. Ozone Hole Watch. Accessed January 31, 2011. NASA Earth Observatory. 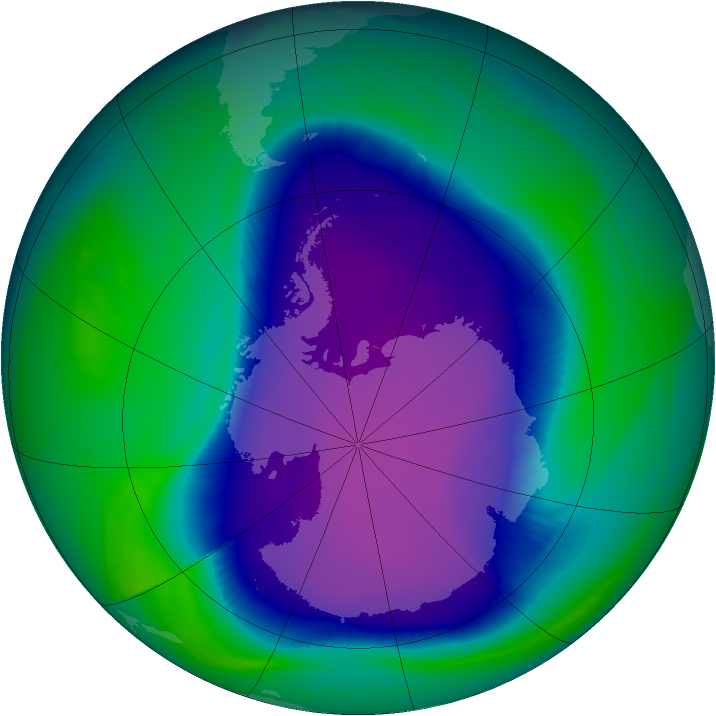 World of Change: Antarctic Ozone Hole. Accessed January 31, 2011. UN Ozone Secretariat. (n.d.) The 2010 Assessment of the Scientific Assessment Panel. Accessed January 31, 2011. NASA images courtesy NASA Ozone Hole Watch. Caption by Michael Carlowicz. 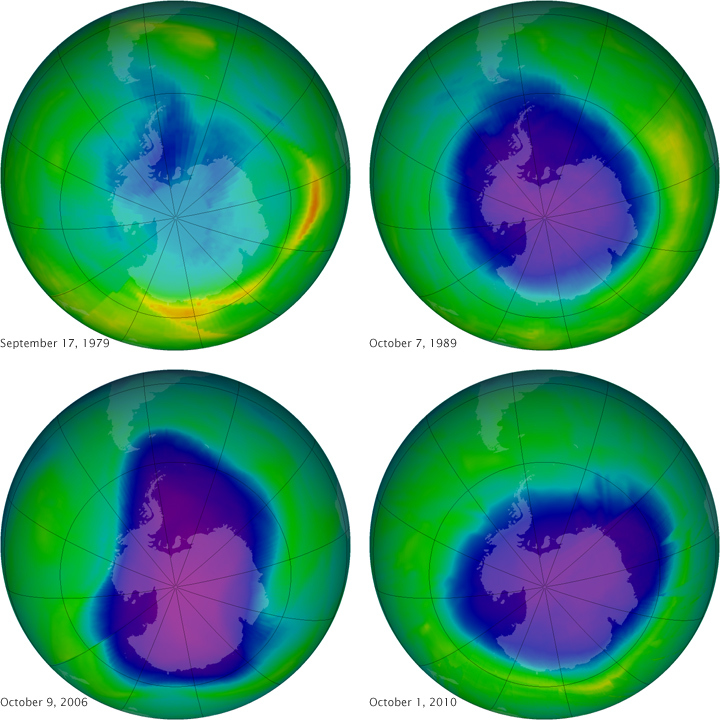 This series of images shows the Antarctic ozone hole on the day of its maximum depletion in 1979, 1987, 2006, and 2010; that is, the days with the thinnest ozone layer.